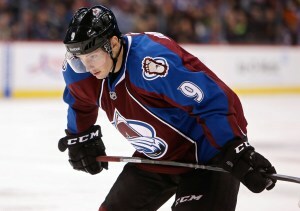 The Colorado Avalanche dismantled the struggling Buffalo Sabres by a final score of 5 to 1 on Saturday evening. Any hockey fan that did not watch the game would guess by that score that the high caliber young talent of the Avalanche had a stellar performance, however this would be incorrect. For the third straight game Matt Duchene, Ryan O’Reilly, Calder Trophy winner Nathan MacKinnon and team captain Gabriel Landeskog all finished the game without a goal. Some of these names did make the point sheet as MacKinnon had an assist on the first goal of the game which was scored by Eric Johnson whom had scored three straight Avalanche goals over a three game span. Then later in the first O’Reilly had the assist on a Cody McLeod short handed goal that put the Avalanche up 2 0. The Avalanche as a team are struggling compared to last season but the four talented young guns up front are prime examples of why this team currently has a below .500 record. Of the big four Duchene is certainly having the best season points wise. He has 20 points with a perfect split of 10 goals and 10 assists but currently sits at -3. In the game against Buffalo head coach Patrick Roy did some major line shuffling and Duchene centered the first line between MacKinnon and veteran Max Talbot, who was on Sidney Crosby’s line the year the Pittsburgh Penguins won the Stanley Cup. The line played well together and was generating scoring chances but did not find the back of the net. Also Talbot showed his versatility when Duchene was stood up in the offensive zone just as a whistle blew. Talbot had no hesitation defending his speedy center as he stood nose to nose with Sabre’s tough guy and former Avalanche player Chris Stewart. This line will certainly remain together for the foreseeable future and will continue to get chances. The reigning Calder Trophy winner was moved from the wing position, where he played last season, back to his natural position of center this season with the departure of free agent Paul Stastny. Unfortunately for MacKinnon as the Christmas break nears he has lived up to the expected sophomore slump. In 32 games so far this season MacKinnon has just five goals but has shown some promise with 15 assists. However being a -10 on the season ties him with Landeskog for second worse on the team behind only Ryan O’Reilly who is -11. Shootout goals aside, MacKinnon last scored on Nov. 13 in the third period against the New York Rangers. 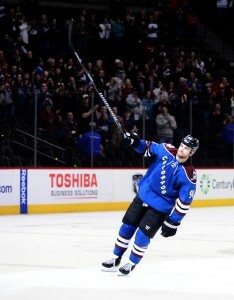 This goal tied the game which the Avalanche eventually won in a shootout, so it was a huge goal for him to score but it has been far to long since his last regulation tally. Maybe waiting until December to move him back to the wing where he was so dominate was a mistake but now he has the chance to regain what he had last season. 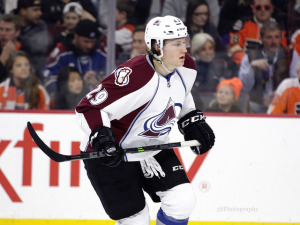 MacKinnon ended last season with 24 goals as a rookie. That number is certainly not unobtainable this season but MacKinnon now has 50 games remaining to score 19 goals. This mean MacKinnon need to be better then one goal every three games for the rest of the season just to match his goal production of last season. The youngest player to ever be named captain in the NHL three seasons ago has become more comfortable with his role as time has gone by. Critics are quick to blame the young Swede when the chips are down but the organization seems confident they have their man. The 6 foot 200 pound power forward has excelled at all aspects of the game through his young career from putting up points to even dropping the gloves when necessary. Landeskog is having a decent year with 19 points but the unusual statistic this season is his 31 penalty minutes. 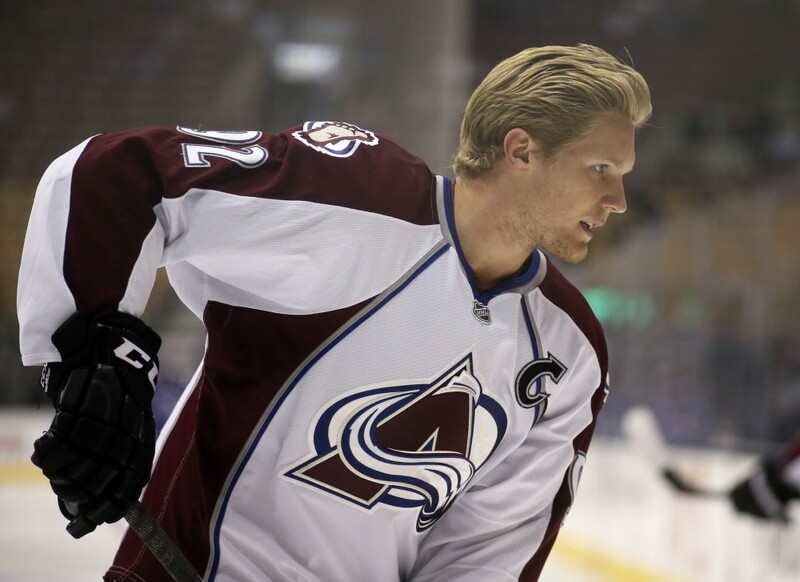 Landeskog currently finds himself second on the team with those 31 minutes only behind tough guy Cody McLeod with 76. Probably Landeskog’s defining moment so far this season came in a game in mid December against the Winnipeg Jets. Past the halfway point of a 1 to 1 hockey game Landeskog found himself lining up for a defensive zone face-off. Across the hash marks, Jets captain Andrew Ladd. Shortly after puck drop gloves hit the ice and Landeskog and Ladd were exchanging bombs similar to there fourth line counter parts. The game would turn out to be a 4 to 3 Avalanche win and certainly the turning point was that fight. Always a threat when he does not have the puck O’Reilly won the Selke Trophy last year as the forward that displays the most skill in the defensive aspect of the game. O’Reilly has always been a threat to put up points and is often at the top of the league in takeaways. O’Reilly is a prime example of the so often called second round gems that teams occasionally find. He made the Avalanche roster his rookie season and has not looked back. So far, this season has been a struggle for the man they call “Factor”. He currently only has 17 points this season and again has the worst plus/minus rating at a – 11. This is the first season of the two year deal O’Reilly agreed to in the off season literally right outside the assigned arbitrators door. Twice he has come up for a new contract and twice it took the long road to get the deal done. O’Reilly only played in 29 games in the lockout shortened 2012-2013 season because he held out looking for more money as a restricted free agent. The Avalanche organization refused to budge until the Calgary Flames made O’Reilly an offer for 12 million dollars over two years. The Avalanche matched the offer the same day but it was clearly not what they wanted to do. With two contract disputes now under his belt if the Avalanche plan to trade the struggling O’Reilly it is safe to say his potential return has been greatly reduced. With the recent line shake up by Roy O’Reilly found himself centering the third line while John Mitchell was centering the second line in his first game back from an injury. This set up did allow the Avalanche to have three very offensively potent lines but O’Reilly’s previous production would not suggest him as a third line center. The Avalanche season is far from over and a playoff run is still possible but these four super stars must step up. While these four can not win every game, any game these four do not score, the Avalanche chances at winning dramatically decreases. Only time will tell if any of these players will match or exceed their point totals from last year when it seemed goals came by the bunches. While it is believed the defensive part of the Avalanche line up is the week spot these four not scoring quickly puts that spotlight on the offense. This young core is now surrounded by several veterans who have playoff experience and have won Stanley Cups. These years of experience will help the young core but it is up to these young guys to put points on the board and win games for the remainder of the season.